Originally published under the title, "Some Wars Should Be Prevented, and Some Wars Should be Preempted." 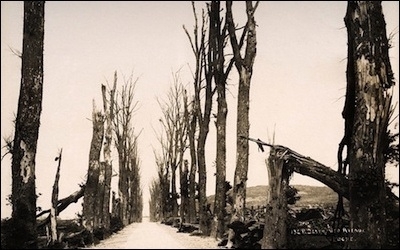 The First World War would have been much less devastating if it had erupted a decade earlier. Most of the great wars of the past would have been far less bloody had they begun sooner. That emphatically is true of the First World War: if Germany had launched a preemptive assault on France during the First Morocco Crisis of 1905, before Britain had signed the Entente Cordiale with France and while Russia was busy with an internal rebellion, the result would have been a repeat of the Franco-Prussian War of 1870 rather than the ghastly war of attrition that all but ruined Western civilization. It was a tragedy that the vacillating Kaiser Wilhelm II rejected the counsel of his general staff and kept the peace. I do not mean to impute moral superiority to Wilhelmine Germany, but to argue, simply, that swift victory by one side was preferable to what followed. It is hardly controversial to argue that Britain and France should have prepared for war with Germany and preempted Hitler's ambitions no later than the 1936 re-occupation of the Rhineland. The West likes to think that it has attained a higher plane of rationality, after the great bloodlettings of its past–the two World Wars of the last century, the Napoleonic Wars of the 19th century, and the Thirty Years' War of the 17th century. This is a self-consoling delusion: it is not more rational, but only enervated. It confuses its own lack of interest in the future with moderation. Willful blindness about our own past blinds us to the character of the prospective combatants in the Middle East. In 1914 Europe had achieved an unprecedented prosperity, dependent on a web of commercial relations binding all the European nations into a single economic organism. The peoples of Europe had less to fear from hunger, disease, or domestic violence than any peoples in human history. Europe's monarchies, moreover, were linked by family ties more closely than at any time in the past. Nonetheless the Europeans chose to eschew their prosperity and sacrifice themselves in now-incomprehensible numbers–for what? For each nation's belief in its own Chosenness, as I argued in my 2011 book, How Civilizations Die. Francesco Sisci argues that the economic development of the Eurasian continent under the benign influence of China's "One Belt, One Road" program may be an important force for peace. That view was also expressed by China's special envoy for the Middle East, Gong Xiaosheng. The question to ask is why Europe's prosperity and economic interdependence failed to hinder the outbreak of the First World War. China's view of the world is rational, but rational to a fault: the Chinese, who have created a civilization that has endured thousands of years by integrating different peoples and suppressing ethnic differences, fail to appreciate how irrationally the barbarians outside their civilization may behave. There is a path towards a Pax Sinica in the Middle East, I argued in 2013, but it requires the calculated use of Chinese influence to frighten the Iranians into behaving themselves. China has concentrated on economic diplomacy, and succeeded brilliantly in the case of the Asia Infrastructure Investment Bank, but I see no indication of a parallel effort in the realm of strategic diplomacy. Like France in 1914, Iran is an ambitious power at the cusp of demographic decline, with one last chance to assert its regional dominance. Some wars will happen, whether we want them to or not. They arise from the roots of national identity. The nations of Europe fought the First World War in the ultimately futile effort to avoid becoming what they are today, I wrote on the 100th anniversary of the outbreak of the First World War: "Men are immoderate. We are not as different from our fathers as we like to think. The childless, hedonistic Europeans of today are the same people who fought and died in their millions for king and country in 1618 or 1814. Anything worth living for is worth dying for; if we can think of nothing we would die for, it means that we have nothing to live for, either – like today's Europeans. Europe learned at length that blood and soil, Kultur and Grandeur, were not worth fighting for. But Europe could find nothing to live for after it forswore the national gods of its violent past. It is dying of enervation and ennui, disgusted with its past and unconcerned for its future, unwilling to bring sufficient numbers of children into the world to ensure its survival for another century." Iran has not yet learned this lesson, and it will only learn it the same way the nations of Europe learned it in the past century. It may be that the ayatollahs are following an apocalyptic script that ultimately will lead to their mutual destruction in a nuclear war with Israel or one of their Sunni neighbors. I doubt that, and I do not think the issue is important. Iran's position in the Middle East today parallels the position of democratic France in 1914: an ambitious power with grand ambitions at the cusp of demographic decline, whose last chance to assert its regional dominance is at hand. 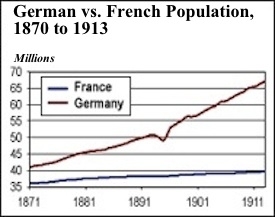 The German and French populations were more or less equal at the outbreak of the Franco-Prussian War in 1870; by 1913, Germany had grown by 70% while France had stagnated, probably because France was the first country to secularize. Anglo-Saxon historiography long has blamed Germany for the First World War, an easy conviction before the bar of history given its culpability for the Second. Christopher Clark has now shown in his bestselling book The Sleepwalkers that Russia's mobilization forced Germany's hand. If one believes the memoirs of the French ambassador to St. Petersburg, Maurice Paleologue, France urged the Czar towards war. Four-fifths of France's military age men were already mobilized in the eight months before the outbreak of war, against half of Germany's. A war of attrition of sorts had already begun; France needed an early resolution because, unlike Germany, it could not sustain the costs continued mobilization. 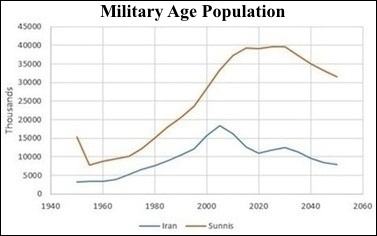 Demographically, Iran is in a position comparable to that of France in 1914: its military-age population is now approximately half that of three most important Sunni states combined (Pakistan, Turkey and Egypt). By 2020 the ratio will shift to only one-fourth, due to the collapse of Iran's fertility rate from 7 children per female in 1979 to only 1.6 in 2012. Its 125,000 Revolutionary Guards constitute the best fighting force in the region after overthrow of the Saddam Hussein regime in Iraq. Although Iran lacks a modern air force, it is the dominant land power in the Levant. Saudi Arabia's new Sunni coalition is an attempt to respond to Iran's depredations in Yemen and elsewhere, but the fractious and divided Sunnis are far from acting in concert. Pakistan is too preoccupied with India and its internal extremists to send soldiers on foreign adventures, and Turkey has no desire to commit to Saudi leadership in the region. Iran's strength will peak during the next several years, especially if the lifting of sanctions gives it the money and authority to modernize its armed forces. I do not propose to argue that belligerence is a mechanical function of demographics. The point, rather, is that all the factors that contributed to European bellicosity in 1914, and above all to German aggression in 1939, apply a fortiori to Iran: national messianism, the perception of historical injustice, the willingness to sacrifice arbitrary large numbers of lives, contempt for the humanity of neighboring states and–above all–the entirely rational perception that time is running out, and that an inevitable war with neighboring states will become impossible to win not very far into the future. Even if the proposed agreement with Iran succeeded in suppressing development of nuclear weapons–in my view an unlikely outcome–it will have given Iran the resources to prepare for the final settling of accounts with the Sunnis on what ultimately will be an horrific scale. If European diplomats were deluded in their attempts to maintain the balance of power in the years before World War I, today's diplomats are mad to believe that a balance of power can be established between Iran and its Sunni neighbors. War is already joined in Syria, Iraq, Yemen, Somalia, Lebanon and Libya. War is not a choice. It is an event. If Iran were to triumph in the relative short-term, Sunni revenge would be all more terrible in the aftermath. A generation hence, a third of Iranians will be older than 60, the first time in all of history that a poor country will carry such an enormous burden of dependent elderly. The younger populations of its Sunni neighbors will overwhelm it. One has to go back in history before the Thirty Years War, perhaps to Tamerlane, to conceive of the carnage that this will cause. If Iran has nuclear weapons they will be used, and others will use nuclear weapons as well. The balance of power in the Middle East fell apart when the United States forced a Shia majority government on Iraq through the elections of 2006. That was a catastrophic error. Nothing will quite restore it. But the next best thing, and the best alternative under the circumstances, is to suppress Iran's ambitions and reinforce the conservative Sunni states as a bulwark against chaos. I continue to believe, as I have argued since 2005, that an American preemptive strike on Iran's nuclear facilities is the best course of action.